The automotive industry has been witnessing subdued retail sales for passenger vehicles segment in recent months because of low consumer buying sentiment. The festive cheer was missing in the auto market this October as leading carmakers such as Maruti, Hyundai and Toyota registered a low single digit growth in sales for the month with high fuel prices and hardening of interest rates dampening consumer sentiments. Mahindra too clocked tepid growth while Honda recorded flat sales during the month. However, Tata Motors and Ford India managed to post healthy sales growth albeit on a small base of the previous year. The country's largest carmaker Maruti Suzuki India (MSI) said its domestic sales stood at 1,38,100 units last month, a mere 1.5 per cent growth from 1,36,000 units in October last year. Sales of mini cars comprising Alto and WagonR were at 32,835 units, up 1.1 per cent compared to 32,490 units in the same month last year. Similarly, sales of compact segment, including models such as Swift, Celerio, Ignis, Baleno and Dzire, were up 3.7 per cent at 64,789 units as against 62,480 units in October last year, the company said. Mid-sized sedan Ciaz sold 3,892 units as compared to 4,107 units in the same month a year ago. 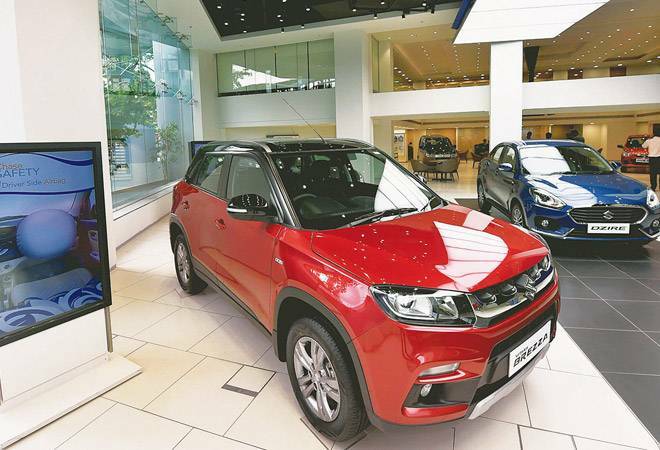 However, utility vehicles, including Vitara Brezza, S-Cross and Ertiga were down 11.2 per cent at 20,764 units as compared to 23,382 units in the year-ago month, MSI said. Although arch rival Hyundai posted its highest ever sales in a month at 52,001 units in the domestic market last month it represented a growth of only 4.9 per cent from 49,588 units in October last year. The Korean company's sales were led by a strong demand for all new Santro and other models like Creta, Elite i20 and Grand i10. Homegrown utility vehicles major Mahindra & Mahindra (M&M) reported 3 per cent increase in sale of passenger vehicles at 24,066 units as compared with 23,453 units in the same month last year. The automotive industry has been witnessing subdued retail sales for passenger vehicles segment in recent months because of low consumer buying sentiment. Therefore, one has to remain cautious on how the festive season ultimately turns out to be, M&M president automotive sector Rajan Wadhera said. Similarly, Toyota Kirloskar Motor (TKM) reported a 2 per cent increase in domestic sales at 12,606 units in October as compared with 12,403 units in the same month last year. TKM Deputy Managing Director N Raja said that they have been able to sustain good customer demand despite the dampening effect on consumer sentiment owing to hike in fuel prices, higher interest rates, increase in insurance premium. Honda Cars sales remained flat during the month at 14,233 units as compared with 14,234 units last October. Despite the festival season, the consumer sentiment has remained subdued last month in comparison to other years. However, Amaze continued its strong performance and the recently launched CR-V created fresh excitement in its segment with its premium offering, Honda Cars India Ltd Senior vice president Rajesh Goel said. Tata Motors on the other hand reported 11 per cent increase in passenger vehicle sales at 18,290 units last month as compared to 16,475 units in October 2017. While the industry grew at 2 per cent, Tata Motors saw a robust growth of 11 per cent. We are therefore pleased to sustain positive traction despite strong headwinds such as hike in fuel prices, higher interest rates and increase in insurance premium, Tata Motors President of Passenger Vehicles Business Unit Mayank Pareek said.